Turkey's economy is one of the few in Europe experiencing positive growth, but as the pace of economic reform slows and a rising current-account deficit looms, pundits are beginning to ask, has complacency set in? Despite the relief provided by the Olympics, this year is turning out to be something of an annus horribilis for most Europeans, defined by a return to recession, rising unemployment and a worsening eurozone crisis that seems to have no end. Turks have been having a rather better time of it, however, as a Europe-wide survey published in August by research group, Euromonitor, disclosed. When asked whether Turkey's economic situation was better than the EU's, some 50% of respondents said it was—compared with just 23% six months ago. Meanwhile, the government was trusted by 57%, against an EU average of 28% (and in Greece, just 6%). This picture suggests that 10 years after it first came to power, Turkey's AKP government and prime minister Recep Tayyip Erdoğan retain widespread popular support. 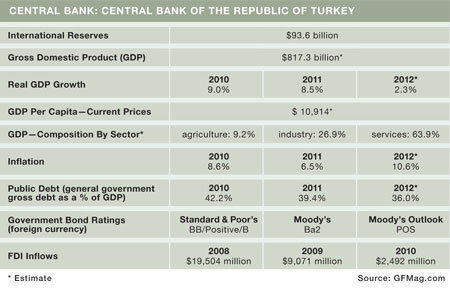 Certainly compared to the outlook of its old rival Greece, Turkey's prospects look pretty good. This comparison holds true of the EU in general, with which Ankara has had strained relations, and with which it has frozen discussions until December—because Cyprus, whose government Turkey does not recognize, holds the EU presidency. These positive findings are supported by recent statistics. GDP in the first quarter showed growth of 3.2%, compared with the zero or negative figures recorded by most EU economies. This figure was more than the 2.8% anticipated, but much lower than the 5.2% recorded in the final quarter of 2011. Growth for 2012 is expected to be between 2% and 4%, well down from last year's 8.5%. Unemployment is currently at a near-record low of 8.2%. And the central bank's controversial methods of tightening monetary policy without massive hikes in the interest rate, including tightening the reserve requirements of Turkish banks, were deemed a success, with inflation in June coming in below expectations at around 8%. There has been good news on the trade front too, with the deficit in June coming in at $7.2 billion, down 30% down from June 2011, while exports––led by manufacturing––rose 12% to reach $143 billion. For observers of the authorities' efforts to engineer a soft landing from the dizzying but unsustainable growth of recent years, these figures suggest success, and may prompt a slight easing in policy to ensure that growth doesn't slow excessively. Many observers expect interest rates to be reduced further. "The current-account deficit is around 8% [against 10% last year], whilst domestic credit growth has slowed dramatically, which suggests tightening is working," says Charlie Robertson, head of strategy at Renaissance Capital in London. 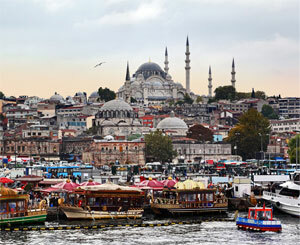 He adds that Turkey has seen some $3.3 billion flow into the debt markets in recent weeks, helping underpin the lira. "Turkey is one of the very few high-yielding sovereign bond plays right now, reflecting the fact it hasn't lost its appeal," he says. This inference has been echoed in foreign direct investment, despite the depressing international outlook, which has had a negative impact on global investment flows. In the first six months total FDI into Turkey surged 21% year-on-year to reach $8.2 billion, with manufacturing attracting $3.1 billion, construction $1.3 billion and finance $715 million. Many foreign companies have stepped up their presence significantly, including Socar, the state oil company of Azerbaijan-a country with which Turkey has strong cultural and linguistic links, and which the government has targeted for enhanced trade and other cooperation. Socar bought Turkish petrochemicals company Petkim and is the major supplier of both the Baku-Tbilisi-Ceyhan oil pipeline and the South Caucasus gas pipeline. It could have as much as $17 billion invested in Turkey by the end of 2017. Unsurprisingly, economy minister Mehmet Zafer Çağlayan suggests: "Turkey is a safe haven for direct investment." However, Turkey's continued dependence on the EU despite all its efforts to diversify remains a potential problem. "The outlook for Turkey is very good, especially if they move ahead with reforms again. But in the short term there are risks bubbling below the surface"
Regardless of Azerbaijan's growing presence, 78% of FDI comes from EU countries—with Britain and Austria leading the way. Similarly, despite the closer relations Turkey has achieved with Asian and Arabic nations, its trade remains dominated by the EU, which means Turkey will probably struggle to boost exports. This likelihood matters because Turkey needs to boost its ratio of exports to GDP from the current level of 17% to the 32% or so that is the norm for countries at its level of development. Such a shift would also reduce the dependence on consumption-driven domestic demand as the main engine of growth, which has boosted inflationary pressures and the current-account deficit. Turkey desperately needs to boost its domestic savings ratio to reduce its dependence on foreign capital, but domestic savings are currently 12% to 13% of GDP, well below what is generally needed to sustain development in a fast-growing economy. The comparable figure for China is around 55%. These concerns explain why on a trip to Turkey in May, IMF head Christine Lagarde said that although Turkey had enjoyed record growth, "vulnerabilities are arising as a result of the large current-account deficit financed by short-term capital flows." Standard & Poor's, moreover, recently downgraded Turkey's outlook from positive to stable, citing long-term debt concerns. The comments concentrated minds on Turkey's short-term economic outlook. "The current-account deficit is definitely the main risk, particularly in a situation where we might see a deterioration in investor sentiment," argues Wolfgango Piccoli, senior emerging markets analyst at Eurasia Group. He says the latter hasn't been helped by the fact that the reform program that drove forward investor interest in the early Erdoğan years has all but ground to a halt. With the budget likely to consume most of parliament's attention when it reconvenes in the autumn, there seems little immediate prospect of this changing. "There seems to be a lot of complacency, which is disappointing. People would like to see, for example, a more modern, transparent tax system––replacing the current overreliance on the special consumption tax––and reforms to employment law, with lower severance payments, more part-time and more female employment," Piccoli says. There are also concerns that government efforts to manage a soft landing may be sidetracked by the deteriorating situation in neighboring Syria, which has already tempered Turkish hopes to further boost trade with Middle Eastern countries. Ankara once had close relations with the Assad regime, but as the casualties and violence have continued to mount, Erdoğan has emerged as one of the leading international campaigners for his removal. "The current-account deficit is definitely the main risk, particularly in a situation where we might see a deterioration in investor sentiment"
Turkey's biggest concern is that the growing chaos in Syria, which has already led to the emergence of an autonomous area in the northeast, where many of Syria's Kurds are based, could reinvigorate calls for an independent state comprising Kurds from Syria, Iraq and Turkey. However, the general domestic mood remains positive, with Turks taking advantage of whatever circumstances allow. Turkish investors are expected to be active in the forthcoming privatizations in Greece, especially of the 23 Aegean marinas and ports that are to be sold. Selim Egeli, head of the Turkish-Greek Business Council within Turkey's ministry of development, told a leading Turkish newspaper, "It is the right time for Turkish companies to invest in Greece." 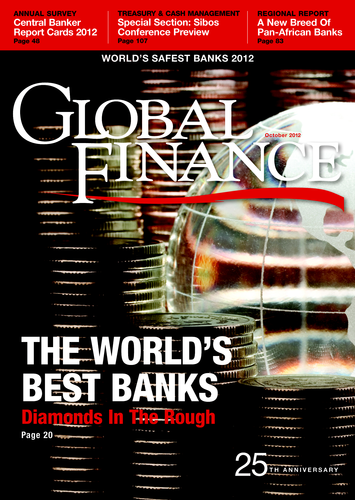 The banking sector also continues to perform strongly. "Turkish banks have proven good at risk provisioning, have managed the global crisis well and don't have NPL [nonperforming loan] problems. The sector is sophisticated and growing," says Robertson. However, analysts point out that risks remain for the sector, which by international standards remains relatively light in foreign assets. This is particularly so if the situation in the eurozone deteriorates and if debt-fueled domestic consumption continues to rise––consumer debt is increasing swiftly and reached YTL270 billion ($150 billion) in July against YTL252 billion ($140 billion) at the end of 2011. "The sector has taken on a lot of short-term debt and is potentially quite vulnerable. It could face a major rollover risk if sentiment turns," says Neil Shearing, emerging markets economist at Capital Economics. Shearing agrees that one of the government's priorities must be to continue to boost domestic savings rates and press ahead with pension reform. However, a number of risks, including the eurozone crisis impacting negatively on investor sentiment for Turkey and European demand for its exports, and a rise in energy prices putting further pressure on the current account, remain beyond its control. "The outlook for Turkey is very good, especially if they move ahead with reforms again," concludes Shearing. "But in the short term there are risks bubbling below the surface which could get serious, especially if the eurozone deteriorates further."